The largest and most powerful of the starships from the Armada Core Set, the Victory-class Star Destroyer formed the core of the Imperial Navy at the outset of the Galactic Civil War. These ships measure roughly nine-hundred meters in length, sport crews numbering over five-thousand, and feature a dagger-shaped design that allows them to concentrate nearly all their weapons on their forward firing arcs. The Victory-class Star Destroyer Expansion Pack bolsters your fleet with one sculpted and pre-painted miniature Star Destroyer identical to the Star Destroyer miniature from the Core Set. It also comes with all requisite tokens and command dials, as well as more than a dozen ship and upgrade cards. The expansion’s two ship cards allow you to outfit your Star Destroyer as either a Victory I or Victory II, and its fourteen upgrades open a wide range of strategic possibilities as they allow you to upgrade your armament, your crew, and even your Star Destroyers themselves. This is not a complete game experience. 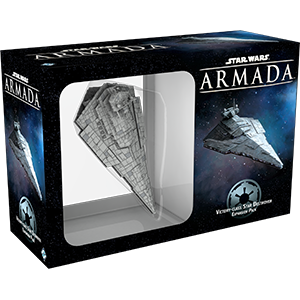 A copy of the Star Wars: Armada Core Set is required to play.